The garden of La Couronne, overlooking the Foret de Retz, is only 90 km from Paris. 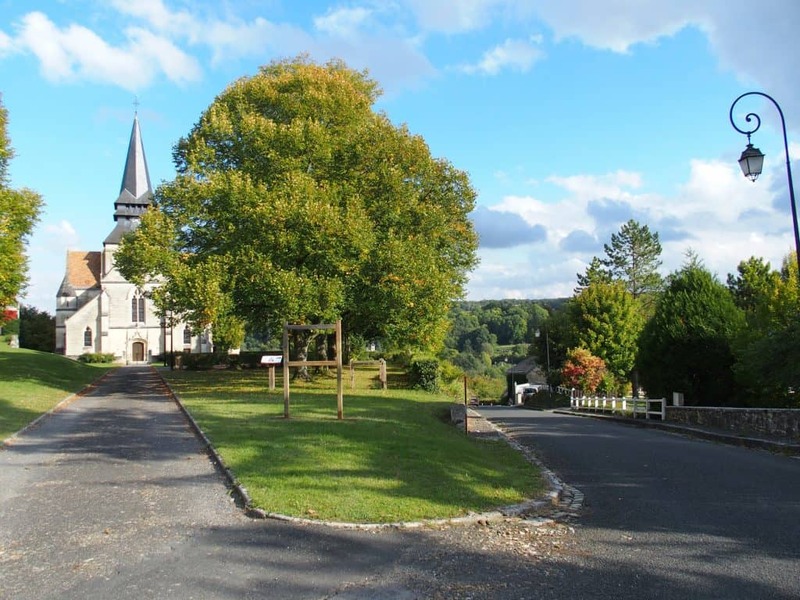 The drive from the airport Charles de Gaulle is about an hour over a national highway and smaller roads through forest, countryside and villages. The journey ends at the crest of a hill in Saint Pierre Aigle, where this cozy B & B, chambre d’hôtes in French, is situated. The Picardie and Aisne regions are just north and east of the French capital. Here grapes are mostly used for champagne, and the tasting opportunities abound. These provinces are equally well known as well a part of Europe where the First World War was fought. 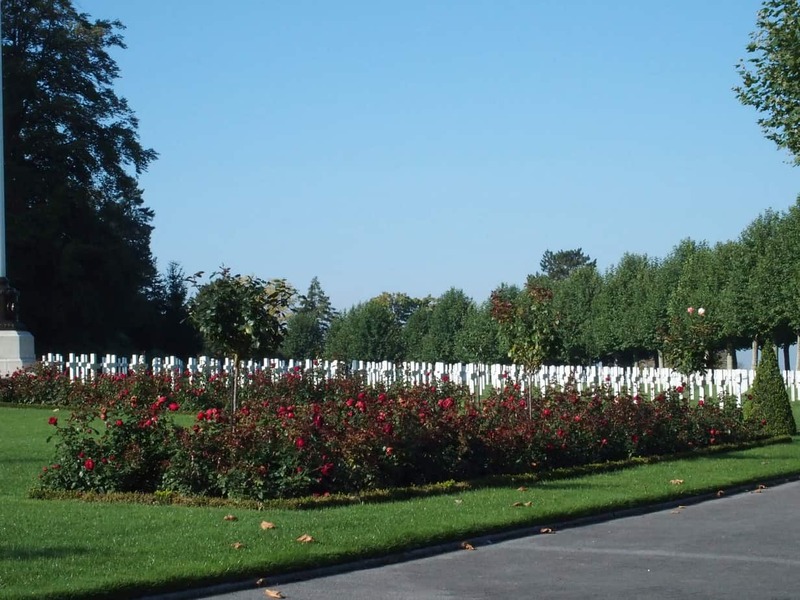 The Chemin des Dames, Belleau Wood, and several American cemeteries are all less than an hour’s drive from La Couronne. We stayed three nights during an autumn visit to the battlefields, cemeteries and monuments to the American doughboys who crossed this part of France one hundred years ago. We wandered through the front gate upon arrival, taking in La Couronne’s well cared for building and grounds. Pierre-Alexandre greeted us, helped us with our luggage and invited us for a cup of tea or un café once settled into our room. The atmosphere is upscale, yet made relaxed by the casual and friendly nature of our hosts. Over the course of our stay the owners, Pascal Evain and Pierre-Alexandre Poulain visited with us as we relaxed in the main room or on the terrace. They were curious about our itinerary and interests, as we were about their lives as propriétaires of a chambre d’hôtes in this small village. The owners of La Couronne are talented, busy and accomplished businessmen. Pierre-Alexandre comes from a family of artists. 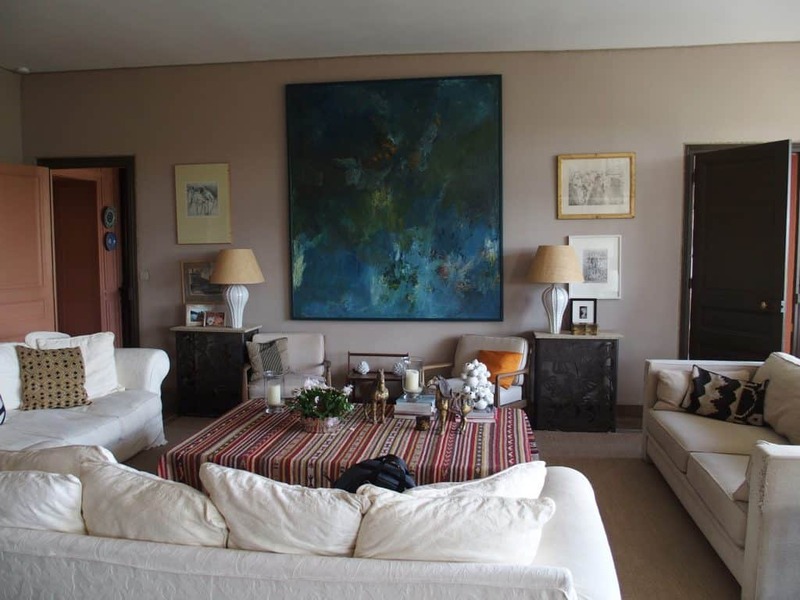 He continues to exhibit his family’s artistic touch, designing metal art furniture and decorative panels. Pascal has a background in finance, as well as a love of architecture and contemporary art. Together they are the principals in Treillage creating decorative panels made of aluminum. The train trip from Villers-Cotterêts to central Paris is a 45 minute ride. The ease of access allows them to work and enjoy the cultural side of Paris from their pied à terre in the city at times during the week. The beds in the five themed rooms are fitted with the same mattresses as that of our hosts and as are used in the quality hotel chain Sofitel. Our full day’s’ schedule, an open window allowing brisk autumn air to fill the room, coupled with the comfortable bed produced fitful slumber. The attention to detail of this amenity was particularly appreciated. We have not always enjoyed such a high quality mattress in other stops along the roads we have traveled. La Chambre Jaipur, which we chose, had a table and chairs in one corner, overlooked by a portrait of a young Pascal reading. Facing the fireplace was a long chaise, a perfect spot for a quick nap or to peel through a few chapters of a novel before dinner. Over the fireplace, set with inlaid blue tiles, was a brilliant gold plated mirror. The double windows opening onto the garden provided sunshine and a view over the valley. 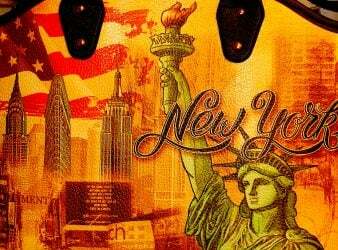 The rates for two guests sharing a room, which includes breakfast, range from 115 to 135 Euros, or $133 to $157 (US dollars at 1.16 Euro). We found this to be reasonable given the amenities and level of comfort we enjoyed at La Couronne. 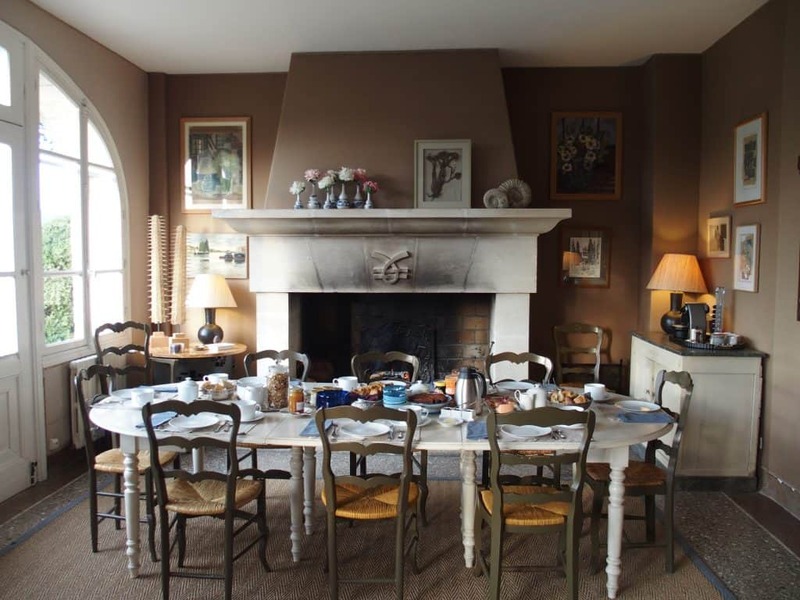 Hosts Pierre-Alexandre and Pascal acquired the property in 2007 and have transformed it into an intimate respite for those fortunate to have the opportunity to stay at La Couronne. The building dates from the 1920’s when it was known as the Hotel de la Couronne. 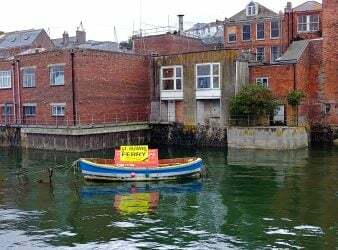 In that era it housed an épicerie, a restaurant and a small hotel. There are five en-suite bedrooms, each with a unique theme and decor. That the owners are artists and music lovers is evident in the tableaus and objets d’art on display throughout the premises, accompanied by soft classical music playing in the background. The town of Saint Pierre Aigle was totally demolished in the First World War. The strategic setting on high ground placed the village in the midst of bombardments and fierce fighting. 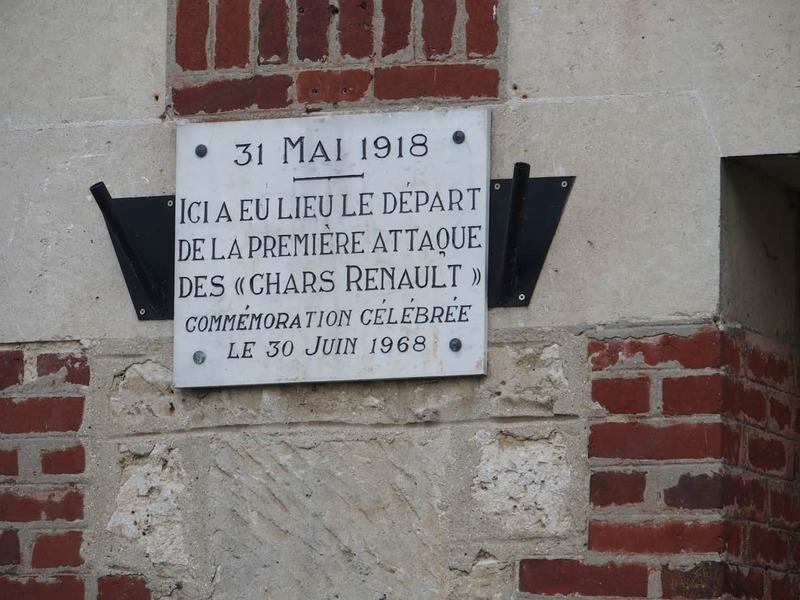 It was from Saint Pierre Aigle in May of 1918 that the first attack using Renault tanks was launched. Pascal is very knowledgeable and interesting to converse with on the subject of the Great War and its impact on this region. After the war, the town was rebuilt. It was during this period that La Couronne was constructed. The work continues as Pascal and Pierre-Alexandre are adding a building to the premises in which to host parties and receptions. The northern edge of the Forêt Domaniale de Retz, also known as the Forêt Villers-Cotterets, is at the base of the hill from which Saint Pierre Aigle provides a vista. It is one of the largest forests in France. The wildlife and flora share nearly 350 miles (560 km) of hiking trails in the forest’s 51 square miles (13,339 hectares). The late afternoon sun provided for pleasant moments in the garden overlooking the forest where we enjoyed a short stroll and time to unwind with a glass of wine after a day of sightseeing. The nippy evening air which arrived as the sun dipped below the trees sent us into the sitting room. Once inside, the combination of the fire our hosts had burning, soft notes from Mozart and the final sips of wine took off the chill as we sunk into the couches in the main room. At night, far from city lights, the sky was peppered with stars. As we star gazed from the terrace overlooking the pitch black valley, the quiet in the was broken by the roar of a male deer echoing across the valley. The bellowing ‘cri du cerf’ we heard, Pierre-Alexandre explained, was a stag announcing his presence to competitor suitors trespassing on his territory. In the mornings, the mid-autumn chill was met by a small fire smoldering in the grand fireplace next to the breakfast table off the main room. 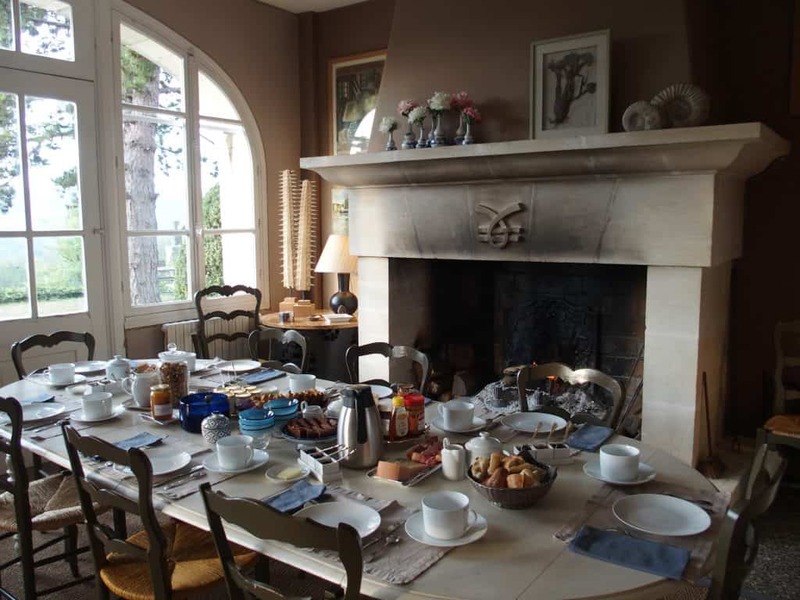 Pierre-Alexandre and Pascal set a sumptuous table, and offered to make eggs to supplement the French breakfast that awaited us each day. There was a jar of honey made by Pascal’s sister to stir into tea or spread on one of the several choices of bread in the basket. There was stewed rhubarb, fresh from the garden on the hillside, and Pascal’s chocolate cake added to the eclectic breakfast selections. The boulangerie is in a nearby village and the baker’s breadmaking skills have been recognized by regional awards, as well as on the bigger stage at a competition in Paris. La Couronne’s order of baguettes and pastries is delivered early in the morning, hung in a basket on the gate to the property. There was also brioche made by Pascal offered. Breakfast was a leisurely affair and provided the opportunity to share adventures, past and planned, with other guests over coffee or tea. Pascal and Pierre-Alexandre were also on hand to chat and eager to provide information about the region. Both are very knowledgeable about the history of the region, the village of Saint Pierre Aigle and the surrounding sites. They were generous with their time in answering questions and sharing the interesting and tumultuous history of this corner of France. Guests do not leave the breakfast table hungry or without having their questions answered. 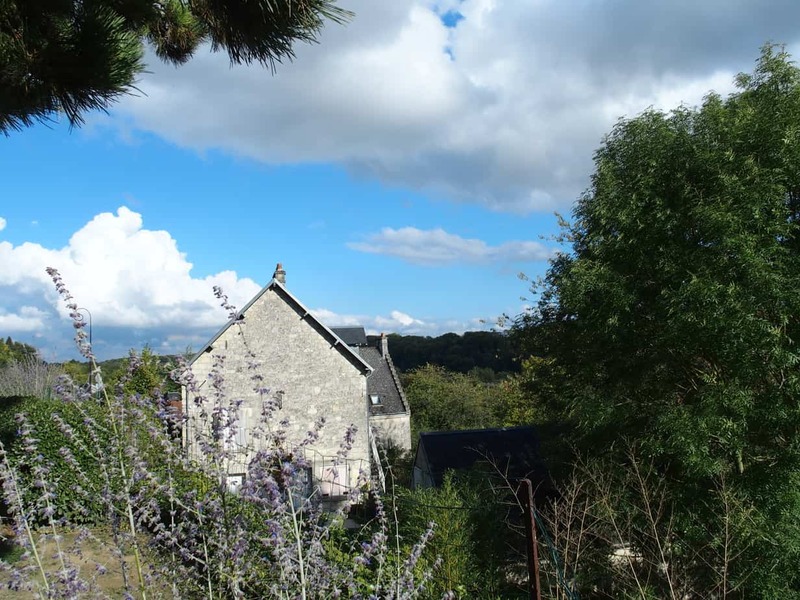 The village of Saint Pierre Aigle is an easy, approximately one hour drive from Charles de Gaulle Airport. There is rail service from central Paris to Soissons or Villers-Cotterêts and the train trip is slightly less than one hour. 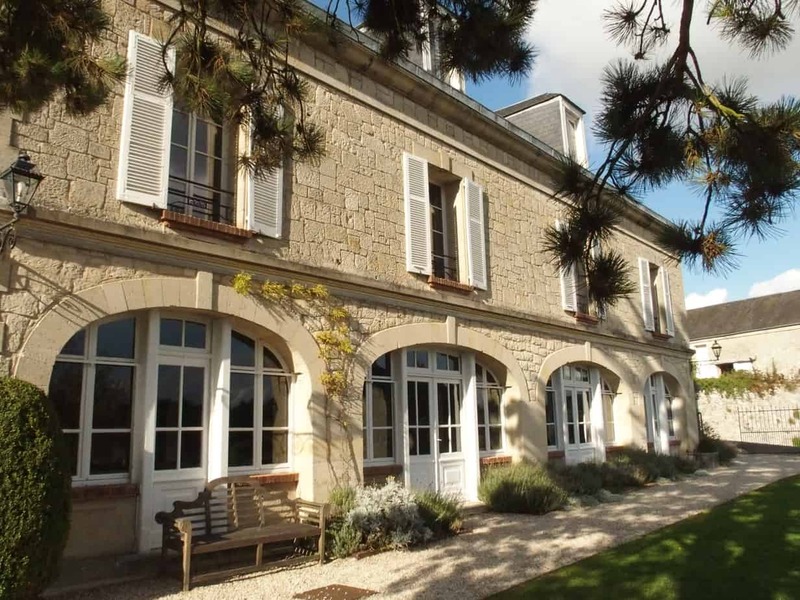 La Couronne is well situated as a base for visits to the battlefields of the Great War. There are ample points of interest for the World War I enthusiast within one hour’s drive in each direction. Though not far from larger towns, the village is remote and an automobile essential. There is no restaurant at La Couronne or in Saint Pierre Aigle, though dinner at the property can be arranged with Pascal and Pierre Alexandre. Soissons, a fifteen minute drive, offers many choices for meals as do several other small towns and villages close to La Couronne. We had dinner two nights at the restaurant at the Hotel de L’Abbaye in Longpont, a less than ten minute drive. The website for La Couronne is in French, though you will find that Pascal and Pierre-Alexandre speak English fluently. Rooms can be booked using Tripadvisor, which has posted multiple reviews of La Couronne. Having the opportunity to travel extensively throughout France, Kevin McGoff shares his experiences and passion for travel in his new adventure as a freelance writer and travel advisor to visitors to the South of France. Kevin and his wife Patty have visited France almost every year since they were married over forty years ago. When not sur la route they live in Indianapolis, Indiana, though family and friends must chase them down from time to time at their apartment in L’Isle sur la Sorgue, a small town in the heart of the Vaucluse département in southern France. When on holiday from his work as an attorney, Kevin enjoys sharing travel ideas and stories of sites seen off the beaten path spawned from wanderings throughout France, Europe and the US. Kevin also assists voyagers in planning and visiting Provence, encouraging leisurely travel and an opportunity to experience life as a local in a small town. Visit http://surlaroutekm.com/ to see his next stop sur la route.